Here is another reunion – but not quiet as formal as the previous reunion I displayed. 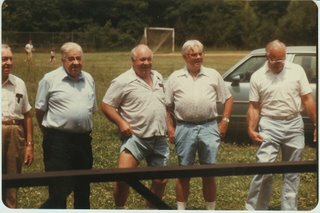 This is the surviving Hunter siblings (except one in the VA hospital) in the early 1980s. There were many more there, but this is the only picture I managed to capture all the brothers for a posing. Daddy is the 2nd one from the left. They look like a lively bunch. By this time their sister, oldest brother, and youngest brother had died but life goes on. They all looked alike, didn't they? Stocky and gray headed! - except Bus on the left end and Stanley on the right end were not stocky. Looks like some of the pix on our wall right now....big families in the south in those days. More than 3 or 4 children per family it just about a thing of the past unless they are all born at the same time and the magazines have to air brush the parents.